I've got some really great under $100 gift ideas tonight! I know I say this every single time, but I seriously want every single thing in this roundup. I'm really hoping that my family members are paying attention and using this guide when they're shopping for me, hehe. I know that a lot of the items are pretty random, but a lot of these things are updates to items I already own. There really is no better time than the holidays to give gifts that are a bit of an upgrade to things your loved ones might already have that are losing their luster. For instance, I've got lots of makeup bags, but they're all a bit tattered and worn, which makes me think that this one from Mark & Graham would be a great gift to get so that I can get rid of the old ones. And I am obsessed with all things Clare V. and that includes this fun iPhone case. I like my phone cases to be on the simpler side but still with something going on, and this one fits the bill. Then there are things that are just straight up new and I'd just love to get them, haha. This headband would be a great way to add some glamour to my usual sweaters and jeans look. And I don't know why, but I really would love to have monogrammed napkins. They probably wouldn't be used all that often, but it would be so nice to have handy in the event that the occasion arises. I hope this helps! And the next gift guide is coming after Thanksgiving, so keep your eyes peeled for that! Hope you all have a wonderful Thanksgiving! 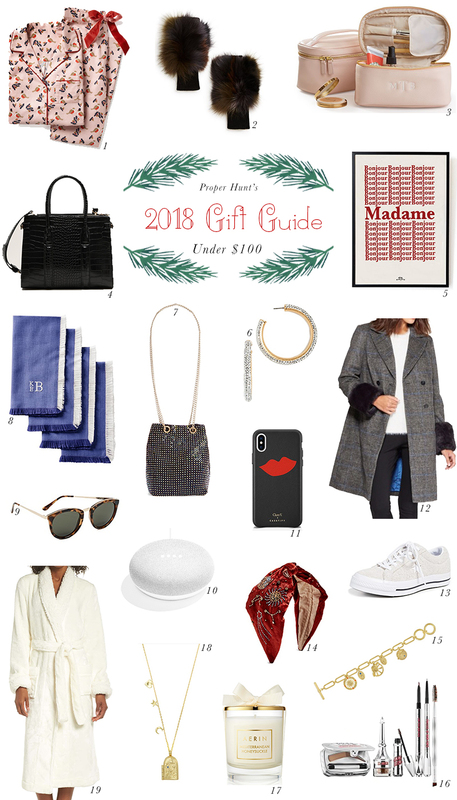 I liked this holiday gift guide under $100. Thanks for sharing this post.